This was written as part of the bincentennial celebrations of the birth of the Franco-Belgian economist Gustave de Molinari who was born on 3 March 1819 in Liège and died at 92 years of age on 28 January, 1912 in Adinkerke, Belgium. It was designed to be the introduction to an anthology of his writings on the state, with brief introductions by me for the extfrascts, and an updated bibliography of his writings. [Le Protectionniste]: A quoi sert d’ailleurs de lutter contre le courant? A quoi cela vous a-t-il servi? Vous avez passé votre vie à n’être pas de l’avis dé tout le monde. Vous l’avez usée à propager des doctrines impopulaires; à quoi êtes-vous arrivé? Je suis fâché de vous le dire, vous n’êtes arrivé à rien. [The Protectionist (addressing the Economist)] Besides, what is the good of swimming against the current? What good has that done you? You have spent your entire life rejecting the opinions of the entire world. You have spent it promoting unpopular doctrines; and what has happened to you? I am afraid/sorry to tell you that you have achieved nothing. Gustave de Molinari (1819–1912) was born in Liège when it was still part of the United Kingdom of the Netherlands (it was later incorporated into the new Kingdom of Belgium in 1830) but spent most of his working life in Paris, becoming the leading representative of the laissez-faire school of classical liberalism in France (the so-called “Paris School” of political economy) in the second half of the nineteenth century. His liberalism was based upon the theory of natural rights (especially the right to self-ownership, private property, and individual liberty), a policy of complete laissez-faire in economic matters, and “la liberté du gouvernement” in politics (by this he meant the private provision of police and defence services by competing insurance companies or small proprietary communities). If they have thought of him at all, historians of economic thought have always found Molinari very hard to categorize. His radical way of thinking about individual liberty and the coercive power of the state has always been seen to be somehow too extreme to be taken seriously. A few examples should suffice. The Italian economist Luigi Cossa in his Introduction to the Study of Political Economy (1891) described Molinari as “extravagant” and “uncompromising”; the French historian Albert Schatz in L’individualisme économique et social (1907) considered Molinari to be part of a strain of “bad” or “economic individualism” because it was so “anti-étatiste”, in comparison to the strain of “good” or “social individualism” (which followed the thinking of John Stuart Mill) which was not so hostile to the state; the German historian of economic thought Raymund de Waha in Die Nationalökonomie in Frankreich (1910) described the “Liberal School” in which he places Molinari, Frédéric Passy, and Yves Guyot as “Die Gruppe der Unentwegten” (the group of undeviating or intransigent ones) and of Molinari in particular he didn’t know whether he should be more surprised “by his clueless naïveté and lack of knowledge about life, or by the inherent cynicism of his beliefs.” Closer to our own day is Joseph A. Schumpeter who, in the very influential book History of Economic Analysis (1954), described Molinari as “indefatigable” and his fellow economists as “laissez-faire ultras” and “anti-étatistes” whose “analysis was methodologically as ‘reactionary’ as was their politics”. He then dismissed them as an inconsequential group who “stood staunchly by the drooping flag of unconditional free trade and laissez-faire” as modern economic and political theory passed them by. The only exception to this very negative view of Molinari’s work was provided by the Italian economist and sociologist Vilfredo Pareto. Pareto began writing for the Journal des Économistes (henceforth JDE) in 1887 (when Molinari was the editor) and had a very high opinion of Molinari as an economist and social theorist. For example, in his Cours d’économie politique (1896) he described Molinari’s Cours d’économie politique as “cet excellent ouvrage” (this excellent work), and in Les Systèmes socialistes (1902) he described Molinari himself as “un des plus profonds penseurs de notre temps” (one of the most profound thinkers of our time). He even defended Molinari against the charge of being a “liberal utopian”, no doubt referring to his work on the production of security, as “en grande partie conçues scientifiquement et fondées sur les faits” (in large part scientifically conceived and founded on facts). It would not be until the 1950s in New York City that a small group of economists and historians, who called themselves the “Cercle Bastiat” (made up of Murray Rothbard, Leonard Liggio, and Ralph Raico, and others), rediscovered the “indefatigable, unbending, anti-étatiste, laissez-faire ultras” like Frédéric Bastiat and Gustave de Molinari and incorporated them into the emerging political and economic theory known as libertarian anarcho-capitalism. Furthermore, by living so long (he lived to be 92) Molinari had the misfortune of living through and participating in the rise and decline of the classical liberal movement in France during the 19th century. He was born four years after the defeat of Napoléon Bonaparte and the collapse of his Empire and died two years before the outbreak of the First World War, which destroyed the European liberal order and ushered in a decades-long period of militarism, interventionism, communism, fascism, and welfare-statism. He lived through the reigns of three monarchs (Louis XVIII, Charles X, and Louis Philippe), three revolutions (the Revolution of July 1830, the February Revolution of 1848, and the Paris Commune of 1871), two republics (the Second (1848) and the Third (1875)), and another Emperor Napoléon (self-declared the “3rd” in 1852). He was also active during two periods when classical liberal ideas were flourishing, that of the 1840s in the last years of Louis Philippe’s reign (which was eventually severely weakened by the February 1848 revolution and the rise of another Napoléon), and then that of the Third Republic in the mid–1870s, before it too lost its way and re-erected tariff barriers, became a colonial power, entered an arms race with the other great European powers, and saw the rise of a new and powerful socialist movement. He also had the time to write a lot of books: about 44 at my last count, or even more if one were to include the scores of articles he wrote for magazines and journals (like the JDE, the Économiste belge, the Journal des Débats) or the many articles for the Dictionnaire de l’économie politique (henceforth DEP) (1852–53). He also wrote prefaces or introduction to nine books written by others, and 18 of his articles (mainly in the JDE) were reprinted as stand alone pamphlets. In this anthology we cannot do any more than provide a sample of the vast range of his thinking on matters pertaining to individual liberty. This selection, as large as it is, covers his thinking about the nature and history of the state, a field to which he gave some startlingly original insights, especially concerning the private provision of police and defence, or what he called “la production de la sécurité” (the production of security). We could have easily put together other anthologies of his writings on free trade, slavery and serfdom, war and peace, unions and labor exchanges, or of his travel writing. It is hoped that this selection of texts which span 65 years of his life can serve as the appetizer for a much fuller meal, should the reader wish to pursue Molinari’s thought further. and his sixties, seventies, and eighties (1881–1909) spent again in Paris as editor of the Journal des Économistes and where he enjoyed the most productive period of his life writing a steady stream of books on economics and historical sociology. even in “retirement” in his early nineties (1909–12) he continued to work and publish even though his health was failing. C’était, si j’ai bonne mémoire, au mois de novembre 1830. Les volontaires, après avoir fait triompher la Révolution à Bruxelles venaient d’entrer à Anvers; la garnison hollandaise s’était réfugiée dans la citadelle. On avait dépavé les rues, et je crois bien avoir fourni ma petite part de besogne aux paveurs. On tiraillait dans la rue du Couvent qui aboutissait à la citadelle, et je vois encore la scène ; un volontaire en blouse bleue, dépassant ses camarades de la tête, brandissait un grand sabre de cavalerie au cri de : « En avant! » Un obus éclate, tout le monde lâche pied, le volontaire au grand sabre bat lestement en retraite derrière une barricade, en criant cette fois : « Nous sommes trahis! » C’est la première impression qui m’est restée de la guerre. The first period is 1819–1840 when the young Molinari was living in his home town of Liège in what was to become after the Revolution of 1830 the new nation of the Kingdom of Belgium. Very little is known about this period of his life as Molinari was a very private person who spoke little or nothing about his personal life and none of his correspondence is known to have survived. What little we know has been gathered by Minart in his 2012 biography and can be summarised as follows. Molinari’s father Philippe had been a physician in Napoleon’s army and had settled in Liège after the wars ended. Gustave was born a few years later and enjoyed a comfortable life in a provincial city which was rapidly industrialising. When he was born, Liège was still part of the Kingdom of the Netherlands ; when he left it was part of the Kingdom of Belgium which had achieved its independence during the Revolution of 1830. We also know that he had a brother Eugène with whom he started a magazine in Brussels in the 1850s called La Bourse du Travail, a wife, Edmée who died in Oct. 1868, perhaps prompting his return to Paris; and two sons Edmond, who was an engineer, and Maurice who was an agricultural researcher. He may have begun to study medicine in Liège, following in his father’s footsteps, but he abandoned it to go to Paris to work as a journalist. It seems that like many others he was drawn to the capital of the French speaking world because of the intellectual excitement and job prospects which it offered to the young, the clever, and the ambitious. La liberté! c’était le cri des captifs d’Égypte, des esclaves de Spartacus, des paysans du moyen âge, et, plus tard, des bourgeois opprimés par la noblesse et les corporations religieuses, des ouvriers opprimés par les maîtrises et les jurandes. La liberté! c’était le cri d’espérance de tous ceux dont la propriété se trouvait confisquée par le monopole ou le privilége. La liberté! c’était l’aspiration ardente de tous ceux dont les droits naturels étaient comprimés sous la force. Very important for Molinari’s intellectual development and his future career were his friendships with the bookseller and publisher Gilbert-Urbain Guillaumin (1801–1864), the free trade advocate and economist Frédéric Bastiat (1801–1850), and the industrialist, economist, and editor Charles Coquelin (1802–1852). Guillaumin’s publishing firm published the books written by the liberal political economists, including most of Molinari’s many books, and provided the funding and facilities for meetings of the Political Economy Society (founded in November 1842) to which Molinari belonged. Guillaumin also edited and published the main journal of the political economists, the Journal des Économistes (founded in December 1841), for which Molinari wrote 23 articles and books reviews during this initial period and of which he became editor some 40 years later in 1881; and what would be the crowning glory of the Guillaumin publishing firm in the mid–19th century, the monumental DEP (1852–53) edited by Coquelin, and in which Molinari played a very important role. In addition to his work for the Guillaumin network Molinari also developed a close friendship and working relationship with Frédéric Bastiat who had come to Paris in 1846 to set up a French Free Trade Association modeled on the English Anti-Corn Law League which had successfully lobbied for the repeal of the protectionist Corn Laws in early 1846. Molinari became one of the Association’s secretaries and worked closely with Bastiat in publishing its journal and arranging public events at which pro-free trade speeches were delivered. He also wrote an important two volume history of French tariff policy which established his credentials as one of the leading critics of protectionism in France. This anthology begins with an early article he wrote on “Le droit électoral“ in the Courrier français, 23 juillet 1846 in which Molinari shows the great originality of his thinking about politics. Here, for the first time, he likens the government to “une grande compagnie d’assurances mutuelles” (a large mutual insurance company), that tax payers are like “un actionnaire de la société” (a shareholder in the company), and taxes are like “charges de l’association” (membership dues). This idea which begins in this article as a metaphor is soon turned into a real possibility for economists to consider in his most important article on this topic ”De la production de la sécurité" which he published in the JDE in February 1949. In 1847 he began writing articles for the JDE, began work editing a two volume scholarly collection of 18th century economic writings for Guillaumin, wrote a two volume history of tariffs, and got an opportunity to give lectures on political economy at the private Athénée royal de Paris. When King Louis Philippe was overthrown in February 1848 and the Second Republic declared, Molinari again joined forces with Bastiat and other friends in two publishing ventures designed to bring free market and limited government ideas to the revolutionaries on the streets of Paris, many of whom were sympathetic to the socialism of Louis Blanc, Victor Considerant, and Ledru-Rollin (the head of “La Montagne” socialist faction during the Second Republic). The first was in February when they began publishing La République française (Molinari, Bastiat, and Hippolyte Castille); the second was in June when they published Jacques Bonhomme (Molinari, Bastiat, Charles Coquelin, Alcide Fonteyraud, and Joseph Garnier). Both were short lived and folded quickly but they reveal how close Molinari and Bastiat were in their political ideals (classical liberal republicanism) and their strategies for achieving change (appealing to the people to change their minds about the real nature of the state). However, their paths diverged in late 1848 as Bastiat became more involved in the Chamber of Deputies and its Finance Committee and Molinari spent more time writing articles and a monthly “Chronique” for the JDE and working on his book Les Soirées. This work was intended as a popularization of key economic ideas in the tradition of J.B. Say, Harriet Martineau, and Frédéric Bastiat and which he wrote over the summer of 1849 and was published in September. In the first months of the Revolution when hundreds of “political clubs” sprang up throughout Paris to discuss all manner of political and economic issues, once the strict censorship laws were no longer enforceable, Molinari and his economist friends started their own club, the “Club de la liberté du travail” (the Club for the Freedom of Working), to confront the socialists face to face with their demands for a government guaranteed job for all, or what they called “le droit au travail” (the right to a job). Their club was forced to close when a group of socialists broke into a meeting and beat up the economists. Later, Molinari regretted that the economists had not stood up to the violent socialists, whom he called a “une bande de communistes” (a communist gang), instead of turning the other cheek and withdrawing. Nevertheless, on the eve of the bloody “June Days” uprising Molinari had not completely given up on reasoning with them. He wrote an unsigned article in the JDE appealing to the socialists to form an alliance with the economists in their struggle since he believed they shared much the same goals (“abondance et justice” and “l’utopie de la liberté”) but differed on the best means to achieve them. The offer became moot after martial law was declared and the press and political clubs were more strictly regulated before eventually being closed down. Sometime in 1849 it appears that a conscious decision was made by the publisher Guillaumin and his colleagues in the Political Economy Society to launch a more concerted propaganda effort to refute socialist ideas. This would be a two-pronged attack, one aimed at a popular audience and another aimed at intellectuals and the political elite. Molinari would be active in both campaigns. On the popular level, Molinari was inspired by Bastiat’s considerable success at refuting popular fallacies about tariffs and subsidies in his two volumes of Economic Sophisms which had appeared at the beginning of 1846 and the beginning of 1848, and by the work of the English woman Harriett Martineau whose work he reviewed for the JDE in April 1849. It was probably then that he decided to write his own collection of “conversations” between “a Socialist,” “a Conservative,” and “an Economist” to show how the natural laws of political economy and an economic system based upon private property could solve France’s problems. He wrote this book over the summer and it was published in September. 1849 is also the year in which Molinari wrote two of his most radical and original pieces on the private production of security, namely his article in the JDE (February 1849) and the 11th Soirée of his book Les Soirées de la rue Saint-Lazare (September 1849). He had been reflecting since 1846 on the similarities between societies, governments, and insurance companies which provided services to their citizens. The leap he made was to stop thinking of this similarity as purely a metaphor and to see it as an actual possibility that real insurance companies could sell premiums to willing customers for specific services which could be agreed upon contractually in advance and provided competitively on the free market. He regarded the “security industry” (“l’industrie de la sécurité”) as an industry like any other, which would encourage “entrepreneurs” or “producers of security” to offer customers or “consumers of security” protection, for which they would pay insurance premiums to have their life and property protected from attack or robbery. Thus police and defense services would be provided by “les compagnies d’assurances” (insurance companies). He would expand on this provocative thesis in his book. The reaction of his colleagues to both his article and his book at the November meeting of the Political Economy Society was very negative and his ideas were dismissed as “delusions of logic”. Molinari’s Les Soirées has another claim to fame for its originality. Given the fact that Molinari discusses in every chapter of the book free market alternatives to government regulation or monopolies, especially so-called “public goods” such as the water supply, streets, and even police protection and national defence (which he proposes in Soirée 11), the book could be described as perhaps the first one volume, comprehensive statement of the classical liberal political and economic worldview ever written. It prefigures later works such as Ludwig von Mises’s Liberalism (1929), Milton Friedman’s Capitalism and Freedom (1962) and Murray Rothbard’s For a New Liberty(1974) with its comprehensiveness and clarity of vision. In his own day this was much rarer but might include such works as Wilhelm von Humboldt’s Ideen zu einem Versuch, die Gränzen der Wirksamkeit des Staats zu bestimmen (Ideas in an Attempt to determine the Limits of the Activity of the State) which appeared in part in 1792 but a complete German edition was not published until 1851 (a French translation appeared in 1867); Herbert Spencer’s Social Statics: or, The Conditions essential to Happiness specified, and the First of them Developed (1851) (no French translation was ever made); and John Stuart Mill’s On Liberty (1859) a French translation of which appeared the following year by Guillaumin, John Stuart Mill, La liberté. Traduit et augmenté d’une Introduction par Dupont-White (Paris: Guillaumin, 1860). On the more intellectual front was the compendious Dictionnaire de l’économie politique (1852–53) which was edited by Charles Coquelin and co-edited by Molinari. It was designed to bring together in two very large volumes the best theoretical arguments, the most detailed statistical evidence, and the most comprehensive bibliographies on key topics, in order to decisively defeat the advocates of government intervention and regulation of the economy. Molinari wrote the main articles dealing with free trade, tariffs, and the grain industry; as well as those on labor (both free and coerced (slavery and serfdom)); colonies, and on war and peace. The DEP was a two volume, 1,854 page, double-columned, nearly two million word encyclopedia of political economy which summarised the state of knowledge of the discipline of political economy. It is unquestionably one of the most important publishing events in the history of mid-century French classical liberal thought and is unequalled in its scope and comprehensiveness. It contained about 252 main articles; 1,352 biographical articles; and 51 significant bibliographical articles, of which Molinari wrote 24 major articles and five biographical articles and was considered to be one of the key figures in its planning and completion. 1849 in some ways was a tuning point in the radicalization of Molinari’s thinking about the proper role of the state. One of the themes that went through Les Soirées was the idea that all public goods could and should be offered privately and competitively on the free market, including the provision of “security” as we have seen. There was also his belief that the state had no right to confiscate private property even for public works programs. Both these contentious points met with sharp criticism in a series of meetings of the Political Economy Society which his book provoked in November 1849, and again in January and February 1850. Molinari was very shaken by two series of events which ultimately led to his leaving Paris to take up residence in Brussels where he was to spend the next stage of his life. The first set of events were the premature and shocking deaths of some of his closest friends: Alcide Fonteyraud died in the summer of 1849 when a cholera epidemic swept through Paris, and Bastiat finally succumbed to his throat cancer on 24 Dec. 1850. Shortly after he left Paris his friend Charles Coquelin died suddenly in 1852 from a suspected heart attack. The second set of events was the coming to power of Louis Napoleon as President of the Second Republic and then his coup d’état of 2 December 1851. Molinari left Paris in disgust and went into voluntary exile in his native Belgium to escape the authoritarian regime of the soon to be declared “Emperor Napoleon III” under which he refused to live. This brought to an end the first phase of his professional working life. The second stage of Molinari’s professional life was the 15 years he spent in Brussels during most of his thirties and forties. He was able to secure a post teaching economics at the Musée royale de l’industrie belge the lectures from which he published as Cours d’économie politique (1st edition 1855, 2nd revised and enlarged edition 1863) and then a second teaching position at the Institut supérieur de commerce d’Anvers (Antwerp). In this period Molinari was still exploring the private provision of public goods, including security services, and working on his theory of value which he thought was a new approach for political economy. In 1861 he collected many of his articles from the previous 15 years which were published as Questions d’économie politique et de droit public, including his radical and pathbreaking article from 1849 on “The Production of Security” which suggests that he still stood by the arguments he presented then which so shocked the members of the Political Economy Society. He also published a passionate statement of his political “Credo” as the introduction to the book, which we also include in this anthology. In it, he denounces the use of violence and calls for peaceful persuasion as the only legitimate way to reform society. Throughout this period spent in Brussels Molinari worked on his treatise on economics. One of its most important sections dealt with the matter of public consumption and expenditure, especially on public goods like the provision of security. He develops his ideas on the nature of plunder, coerced labour such as slavery, the wastefulness of government spending and monopolies, the private provision of public goods, the proper functions of government in the era of competition, and a restatement of the benefits of what he now calls “la concurrence politique” (political competition, or competing governments) or “la liberté de gouvernement” (this was analogous to “la liberté des échanges” or free trade). The idea of insurance companies providing security services to clients in S11 has been expanded into a more generalized economic theory of the state, how it provides all kinds of services, not just security services, and how this evolves over time towards the future era of competition in which the private and competitive provision of all so-called “public goods” has become the norm. Parallel to his academic and teaching duties at the Musée royale was his publishing and writing duties as proprietor of the journal L’économiste belge which appeared for 14 years from 1855 to 1868. In its pages he defended free trade and analysed political and economic events from a radical free market perspective. In this anthology we have included one of these short essays on ”De l’administration de la Justice" (June 1855) on the very high cost and poor service provided by the monopoly police and court system in Belgium. In another book of “conversations” which he published in 1855 Molinari responded to food riots which had broken out in Brussels in September 1854 over the high price of bread. In this book he returned to the structure he had first used in Les Soirées, namely a series of arguments between three participants with divergent views. In this case the conversation was limited to the question of the grain trade and took place between a rioter, a trade prohibitionist, and an economist: Conversations familières sur le commerce des grains (1855). Like the conversations in Les Soirées, these “familiar conversations” were designed to appeal to a more popular audience of people who were sceptical of or opposed to free market ideas. This book would not be the last time Molinari would attempt to reach a more popular audience using this format. When he republished the Conversations familières in 1886 he added an addendum which was much bleaker and more pessimistic. By then, he had come to realise that the classical liberals had lost the intellectual argument with the public which had accepted the socialists’ ideal that the state could and should regulate production and redistribute the proceeds to its citizens. In the aftermath of Napoleon III’s coup d’état Molinari also wrote a series of books on political issues beginning with the nature of the new form of “despotism” which was emerging during the Second Empire. His first book on the topic sought to examine the powerful vested interests which benefited from the new Bonapartist régime - Les Révolutions et le despotisme envisagés au point de vue des intérêts matériel. (1852) - while the second sought to explore the political and economic ideas held by Napoleon III which motivated him to pursue the policies he chose - Napoleon III publiciste; sa pensée cherchée dans ses écrits; analyse et appréciation de ses oeuvres (1861). In Les Révolutions et le despotisme is an excellent example of classical liberal class analysis of the groups who benefited or lost from the coming to power of the new Emperor, in this case the class of “les payeurs de taxes” (tax payers) who were pitted against the class of “les mangeurs de taxes” (tax eaters) and Molinari thought it was the function of the economists to be “les teneurs de livres de la politique” (the bookkeepers of public policy) who could draw up a balance sheet of society showing the profits and losses which resulted from that conflict. This is a task Molinari undertook repeatedly for the rest of his life. During the Crimean War (1853–56) when France, England and the Ottoman Empire fought the Russian Empire over the rights of the Christian minority in Palestine, he wrote a long book about the 18th century advocate of peace and international arbitration the abbé de Saint-Pierre (1658–1743) whose work had influenced Rousseau and Kant. His interest in war and peace is another strain of his thought which he continued to write on for the rest of his life. He had written the long article on “Paix — Guerre” for the DEP in 1853; he reported on the various “Friends of Peace” congresses for the JDE; during the Crimean War he wrote on the laws of war, perpetual peace, and the work of abbé de Saint-Pierre; he explored the important part war played in the historical development of the state in his pair of books dealing with political and economic evolution, L’évolution économique du XIXe siècle (1880) and L’évolution politique et la Révolution (1884); he wrote a plan for a League of Neutrals, “Projet d’association pour l’établissement d’une ligue des neutres,” which he got published in the London Times (July 28, 1887); and a significant book late in his life Grandeur et décadence de la guerre (1898) in which he returned to many of these same themes. In 1858 Molinari engaged in a series of debates with Frédéric Passy on the issue of freedom of education which were published in the Économiste belge. Passy took the mainstream liberal view that there should be a complete separation of state and education with the state taking no part in the provision of education services. Molinari took the view that the state should make education compulsory but not to engage in its provision which should be provided privately. According to Molinari’s theory of “tutelage” he believed that the weak, vulnerable, negligent, and ill-informed should be forced to send their children to school in order to provide them with the skills they needed to function adequately in society. This was one of a small number of exceptions to strict anti-state views which Molinari was to advocate during his lifetime. As the decade of the 1850s drew to a close Molinari accepted an invitation from Tsar Alexander II to go on a speaking tour of Russia to talk about his free market ideas and his views on slavery and serfdom (on which he had written for the DEP) and to advise him and his senior bureaucrats on the abolition of serfdom which he was planning and would enact in the Emancipation Manifesto of 3 March, 1861. Molinari spent six months traveling across Russia observing the economic conditions of the country and speaking to groups of politicians, bureaucrats, academics, and journalists along the way. He published an account of his travels, Lettres sur la Russie (1861), which was the first of many books of travel writing which he was to publish in the next phase of his career. La classe dirigeante a partout et toujours, l’expérience de tous les peuples est là pour l’attester, une tendance naturelle à augmenter ses attributions, à multiplier les emplois qui lui sont ouverts et à accroître ainsi, incessamment, le fardeau des charges publiques. Comment en serait-il autrement ? La classe dirigeante ne prend-elle pas toujours et nécessairement dans le budget une part supérieure à sa propre contribution? After the death of his wife in 1868 Molinari returned to Paris to work for the prestigious and influential Journal des Débats, becoming editor from 1871 to 1876. Another reason for returning was that it seemed that Napoleon III was planning to liberalise his régime by lifting some of the restrictions on the freedom of the press and when the battle for free trade was again current as the renegotiation of the 1860 free trade treaty with Britain came up for renewal in 1870. He left the day to day running of his journal the Économiste belge (which he eventually closed in October 1868), gave up his academic post, returned to Paris, and began writing for the Journal des Débats.. This phase of Molinari’s life lasted 14 years when he was in his late forties and early sixties. The hopes of a liberalisation of the Second Empire were dashed when Napoleon III foolishly declared war on the Prussians in 1870 which triggered a catastrophic military defeat and the abdication of the Emperor, followed by a socialist uprising in Paris and the coming to power of the Paris Commune. Molinari was present to witness these extraordinary events which he documented for the Journal des Débats in many articles which he subsequently published as two books: Les Clubs rouges pendant le siège de Paris (1871) and Le Mouvement socialiste et les réunions publiques avant la révolution du 4 septembre 1870 (1872). His discussion of how a besieged city could allocate scarce food supplies using a free price system is particularly noteworthy in his account of the Paris Commune. This was the second time Molinari had had first hand experience of a revolution in Paris and had attended socialist and revolutionary clubs to observe their activity and to learn about the ideas their participants espoused. Perhaps as a result of this journalistic activity Molinari was made editor in chief of the Journal des Débats in 1871, a post which he retained until 1876. Another book appeared as a result of the political turmoil which gave birth to the Third Republic in 1870 and the formation of a new constitution in 1875. This was his one and only work of political theory La République tempérée (The “Tempered” or Hardened/Strengthened Republic) (1873) which was published as the constitution of the Third Republic was being discussed. His solution to the problem of creating a republic with limited powers was a popularly elected lower chamber which would initiate legislation and an upper chamber made up of the highest taxpayers who could veto spending bills. These were ideas he had first toyed with in an early article on electoral reform which he wrote in 1846. For his work on La République tempérée he was recognised by the French Academy whose members elected Molinari a corresponding member in 1874. 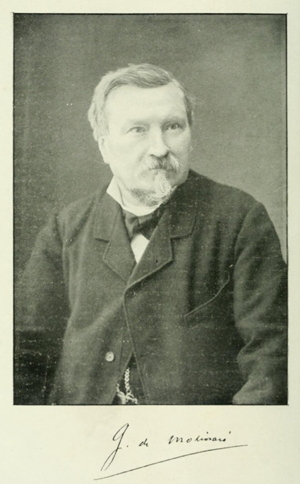 In 1876 the Journal des Débats sent him, at the age of 57, to cover the World Exposition in Philadelphia which started a ten year period during which Molinari travelled the world and wrote about what he observed. He had an acute eye for economic detail as one would expect from someone with his background. His travels in 1876 took him to Canada and the U.S for the centennial celebrations of the American Revolution. Further travels in the early and mid–1880s took him to Canada, U.S., Jersey, Russia, Corsica, Panama, Martinique, and Haiti. All his reports were first published in the Journal des Débats and then as books. He was 67 when he finally gave up traveling and writing about his travels in 1886. Somehow between all his travels and his editing duties he found time to write what would become a major work of political and economic sociology which would rival what Herbert Spencer was doing at the same time in England. Between January 1877 and July 1879 he wrote a series of seven articles for the JDE which eventually became his first book on political and economic sociology, L’évolution économique du XIXe siècle (1880); and then between August 1881 and December 1883 he wrote another series of nine articles for the JDE which eventually became his second book, L’évolution politique et la Révolution (1884). His goal was to provide a more detailed account of the economic and political evolution of societies which he had only briefly explored in some of his earlier writings. In these two books Molinari explained how European economies had evolved from small scale production to large scale, how the role of the military changed from being an essential defence against barbarian invasions to being a parasite on modern industrial enterprises, how the spread of the free market and competitive international industries were making war increasingly redundant, and how free political institutions emerged in the 18th century only to be compromised by the emergence of the new bureaucratic state created by Napoleon and his successors. Like Spencer, Molinari was interested in exploring how states and markets evolved or “progressed” over time, often through peaceful competition but more often by means of the violence of war and class conflict. It is possibly that he was inspired by the translation into French of Herbert Spencer’s major works which appeared in the mid and later 1870s, but it is more likely that he did so independently, since he does not mention Spencer directly. Spencer’s Principles of Sociology began appearing in 1878 when Molinari was well into his very similar project. These important books were the first of several on the topic of political evolution which would preoccupy him during the next stage of his career as the editor of the flagship of the liberal political economists, the Journal des économistes, most notably Grandeur et décadence de la guerre (1898) and Économie de l’histoire: Théorie de l’Évolution (1908). Un jour viendra toutefois, et ce jour n’est peut-être pas aussi éloigné qu’on serait tenté de le supposer en considérant la marche rétrograde que la révolution a imprimée aux sociétés civilisées; un jour viendra, disons-nous, où la servitude politique perdra toute raison d’être et où la liberté de gouvernement, autrement dit la liberté politique, s’ajoutera au faisceau des autres libertés. Alors, les gouvernements ne seront plus que des sociétés d’assurances libres sur la vie et la propriété, constituées et organisées comme toutes les sociétés d’assurances. The final stage of Molinari’s long and productive working life was the 28 years he spent as editor of the Journal des Économistes following the death of Joseph Garnier in 1881. At the age of 62, when other men might have been thinking of retiring he entered another productive phase of his career during which he wrote a further 20 books. In the first half of the 1880s he continued his travels and his travel writing (as noted above). As the momentum towards free trade faded under the Third Republic and new tariffs like the Méline tariff (1892) were adopted, he continued to publish extensively on the evils of protectionism and the benefits of free trade, including the 1886 reprise of his 1855 book Conversations familières sur le commerce des grains, with a new pessimistic addendum in which he reacted to the resurgence of protectionist ideas in the intervening 30 years and of course, his many articles on free trade and protection in the JDE. Another major area of publishing activity remained economic theory which continued to interest him in later life, specially Malthus’ theory of population and the intersection of economic and moral theory which he thought was a new way in which the arguments of the interventionists, whether conservative or socialist, might be countered. Molinari continued to be a staunch Malthusian and republished Joseph Garnier’s book on population in 1885 (first published in 1857) with updated notes and statistical appendices to bring it up to date, and then his own abbreviated edition of Malthus’ classic work The Principle of Population in 1889 which was directed to a more popular audience. In addition, in the space of six years between 1897 and 1893 he published four more books on the basic ideas of political economy, the natural laws which governed the economic sphere, and the moral theory he thought appropriate for living well in a free market economy: Les Lois naturelles de l’économie politique (1887), La Morale économique (1888), Notions fondamentales économie politique et programme économique. (1891), and Précis d’économie politique et de morale. (1893). He also found time to return to one of his pet topics from the 1840s, namely labor exchanges, in Les Bourses du Travail (1893) where he provided some intriguing historical information about why he became interested in it originally and how his idea of a market solution to labour problems was still relevant and would help the economists counter the seemingly irresistible rise of socialist and labor parties in the late 19th century. Related to his work on economics and morality was his continued work in opposing the organized socialist movement. As he recognized the legitimacy of many of the claims of workers, such as their difficulties in finding jobs in a rapidly changing economy, the costs imposed upon them by tariffs and subsidies to favoured industries, and the financial pressures on poor families caused by population growth, he attempted to appeal to them and their leaders in the socialist movement with works in the late 1890s on how a free market classical liberal like himself would solve “the social problem,” Malthusian population growth, and the slump in farm incomes as international competition from the New World increased: La crise agricole ses causes et ses remèdes (1896), Comment se résoudra la question sociale (1896), and La viriculture; ralentissement du mouvement de la population, dégénérescence, causes et remèdes (1897). The latter in particular was a peculiar work as Molinari put forward a liberal theory of eugenics whereby people, through exercising their voluntary choice in selecting appropriate partners with whom to raise a family, would improve the race over time. His theory was based on a number of classical liberal conditions which make his theory very different from other theories of eugenics which were current in the late 19th century. The first condition was that there be complete freedom of movement of people across national borders so that the “best” features of each culture and race could be seen and taken advantage of when people made their choice of partners, and that there should be what he called “la liberté de la réproduction” (freedom in reproductive rights) in choosing when and how many children to conceive. Another curious new area for him was the topic of religion and science on which he wrote two books in the early 1890s: Religion (1892, trans. into English 1894) and Science et religion. (1894). Molinari’s own religious views are hard to pin down. It seems he was a deist of some kind and not a practising Catholic as his many critical remarks about the Church suggest. In his journal L’Économiste belge he tells his readers that he was quite proud and defiant that the Catholic Church had put the DEP, on which he had worked so hard and contributed so many articles, on the Index of banned books in the mid–1850s for its views on Malthus and family planning (coyly called “moral restraint”). He also had a memorable passage on the Church where he likened its monopoly in many countries to that of an industry which had been able to acquire a monopoly in providing a certain good or service with dire consequences for the consuming public with higher prices, poor service, and lack of innovation. And then there were his many critical remarks about the enormous power of the Church and the manner in which it worked hand-in-hand with the State to secure privileges and benefits for itself over the centuries. Yet, in these two works he argues that the Church does serve a positive role in imparting moral principles and a code of conduct to people who might not otherwise think about such things very deeply. He seems to conclude that an institution like the Church is necessary in order to serve a “tutelary role” by helping to instill ideas about property and individual dignity in the very people the socialists were beginning to attract in large numbers to their program of regulation of the economy, redistribution and even confiscation of property, and revolutionary change in the structures of government and society. His argument goes as follows: too many people are too easily swayed to succumb to pleasures in the present and not to restrain themselves by saving for the future or the care of their families in the present. Only an institution like the Church can encourage people to take a longer term view of their life (i.e. to have longer time preferences) by promising them rewards and punishments in the after-life. This seems to be another example of the “tutelage” which he thought in his later years the state and other institutions needed to exercise over some ordinary people to assist them in the difficult transition to a fully free society. In spite of all these other issues which occupied Molinari’s time and energy while he was editor of the JDE he kept returning to the central problem of the proper functions of the state and the role of free markets in providing public goods. The second volume of his work on historical sociology, L’Évolution politique et la Révolution, appeared in 1884 and towards the end of the book he speculates on what "Les gouvernements de l’avenir,” might look like if free markets and competition continued to develop. Here he discusses how the economic changes he discussed in the first volume (EE 1880) will affect what he calls “l’industrie du gouvernement”. As in other industries the spread of the division of labour and competition will inevitably change the way governments function and they too will be run like private enterprises - “un gouvernement d’entreprise”. And just as “la servitude économique” created by monopolies and tariffs lead to the movement to introduce “la liberté des échanges”, so would “la servitude politique” lead to a similar movement to introduce “la liberté de government.” He introduces a couple of new ideas of how this process might proceed with some interesting comments on the possibilities of competition between local governments within a state to keep the cost of government down, including the ultimate threat of secession if all other attempts failed to keep then power of the state in check. In another long work, Les Lois naturelles de l’économie politique, which appeared as articles in the JDE in the first half of 1885, and was published as a book in 1887, he discusses the tendency of all forms of government to increase their powers but which has been made worse in the current period by the expansion of “hidden” indirect taxes which are not clearly visible to the ordinary voters and taxpayers. He continues to argue that the only way to bring the current system of “la servitude politique” to an end is to encourage competition and even secession at all levels of local and regional government in order to keep the cost of “servitude” to a minimum. Otherwise he feared, the state will eventually run into a fiscal brick wall which would stop its growth for good, namely the fact that its expenses were increasing much faster than its tax base. As the turn of the century approached Molinari returned to some of the questions he had addressed 50 years earlier in Les Soirées in 1849. In his Esquisse de l’organisation politique et économique de la Société future (1899) he still argued that the evolutionary tendencies set in motion by the free market system and by industrialization would lead to the formation of a dramatically freer, more deregulated, and market-based society in which the state played a diminishing role. Even when it came to the question of the provision of police and security he back-tracked only slightly after a lifetime of criticism from his colleagues. He now admitted that there were some natural monopolies or “collective goods” which only a state or state-like entity could provide, such as police and defence. There is no longer any talk of privately competing insurance companies offering customers premiums for defence and police services on the open market as he had provocatively argued in 1849 and 1855. (S)i la liberté et la propriété de chacun n’étaient point reconnues, délimitées et garanties, aucune société ne pourrait subsister; ce serait entre les individus isolés ou associés une guerre permanente et universelle, jusqu’à ce que les plus forts eussent asservi les plus faibles; et comme il y a toujours inégalité entre les forces, la lutte se continuerait d’une manière indéfinie, sans autre terme possible que la destruction de l’humanité, moins un homme. De là, la nécessité de la constitution d’un pouvoir assez intelligent pour reconnaître et délimiter la liberté et la propriété, assez fort pour les garantir, c’est-à-dire d’un gouvernement. On voit d’emblée quelles sont les pièces essentielles de cet appareil du droit. Un gouvernement doit réunir un ensemble d’institutions destinées à reconnaître et à délimiter la liberté et la propriété, à établir la tutelle et les servitudes qu’exigent leur exercice et leur garantie, et notamment un système de pénalités ayant pour objet de prévenir, en les réprimant, les atteintes qui peuvent y être portées, avec les procédés appropriés à la constatation de ces atteintes. En même temps il doit posséder et mettre en œuvre une force suffisante, sous la forme d’une armée et d’une police, pour préserver de toute invasion ou agression extérieure ou intérieure la liberté et la propriété de tous et de chacun. Tel est l’objet et telles sont les pièces nécessaires d’un appareil de gouvernement. He thus believes that there must be one and only one final arbiter of what the law is in a given society and any given time. This is something the modern anarcho-capitalists reject as they believe that the creation of law is a spontaneous activity in which emerges as the product of individual engaging in legal activities such as drawing up contracts, voluntarily resolving any disputes which arise, and seeking protection of their properties and liberties in a private market of defense and conflict resolution providers. One can find in Molinari’s writings a few scattered thoughts on how “the production of law” might take place privately and co-operatively but they are not well developed unfortunately. For example, in the Cours d’économie politique he talks about the multiplication and diversification of new legal “appareils” (devices, apparatus) which would spring up to solve disputes (“contestations continuelles”) involving property rights. He describes this legal process of dispute resolution “une justice ad hoc” (ad hoc justice) which he does not describe in any detail but which suggests a kind of common or customary law developed by the parties involved in disputes. However, in spite of a gap in his thinking about the production of laws, Molinari and the anarcho-capitalists do agree broadly on how law can be enforced once it has been decided what it is: both believe that the provision of protective services can be supplied by contracting for these services in a competitive market. Thus, even at the turn of the century, Molinari still should be regarded as a radical classical liberal who continued to push the boundaries of orthodox liberal belief. In his later works he still believed in the radical decentralization of political power to local entities such as towns and cities who would contract out the provision of security services to private companies and which would compete with other cities and towns in offering would-be citizens of their locality an attractively priced package of social services. Molinari also thought that there would emerge what we now call “gated communities” which would be built by private development companies which would sell homes with already constructed roads, sewers, gas, and other services to home buyers. He thought that in this way the free market would continue to take over most if not all of the functions supplied by the government, thus completing the evolution to a fully “industrial society.” Thus, one could definitely say that Molinari was optimistic in the longer term that evolution would continue to push societies in a liberal direction. At the relatively advanced age of 66 Molinari came to the attention of the British people with an important article he got published in The Times of London on 28 July 1887 on his ”Projet d’Association pour l’établissement d’une Ligue des neutres.” He was becoming increasingly concerned about the arms race which was taking place between the Great Powers of Europe, the great expense this was creating for European taxpayers, and the dangers this posed for the outbreak of another European-wide war. In the article he puts the case for the creation of a League of Neutral states (such as Holland, Belgium, Switzerland and Denmark under the general leadership of the great free trade nation of Great Britain) in order act as a counterweight to the growing military power of the other large states of Europe, in particular Germany. By publishing his plan for such an Association in the Times Molinari hoped to win over public opinion in England, which still remained pro-free trade by and large, and to exert pressure on its European neighbors before it was too late. Ten years later he wrote yet another book, La Grandeur et decadence de la guerre (1898) in which he expanded his arguments on the dangers war posed for Europe. War might have been necessary at some time in the past to secure the borders against barbarian invasions, but in the present interconnected world of international trade and the division of labour war had completely lost its “raison d’être” and had become “decadent”. The reason he believed was the fact that powerful vested interests benefited considerably from war expenditure, such as the the officer class, “les fonctionnaires militaires et civils”, appointed or elected politicians (which he now describes as “la classe de politiciens”), and various banking and industrial interests who benefited from lending money to government to fight wars or making war materiel. With some prescience, Molinari expressed his lack of optimism about the chances for preventing another war in the near future so long as these trends continued. The turn of the century gave Molinari an opportunity as editor of the JDE to use his annual survey of the state of the world to write about the future and the prospects for liberty in a society that was increasingly becoming militaristic, statist, protectionist, and socialist. In two important articles he wrote a retrospective analysis of the achievements and failures of the 19th century, 80 years of which he had personally lived through, and a follow up prospective survey of what he thought lay in store in the 20th century. This was followed shortly thereafter by a book on the topic, Les Problèmes du XXe siècle (1901). In these articles Molinari showed a mixture of optimism and pessimism. He was optimistic that the forces unleashed by the prodigious increase in productive power (le développement extraordinaire de la puissance productive de l’homme) made possible by economic liberty and the industrial revolution during the 19th century would continue into the future, but this was tinged with growing pessimism. He came to believe that this upward trend would be destroyed by the resurgence of protectionism, the growing militarism of the major European powers, the increasing power of socialist parties, and the injustice of colonialism. Behind it all was what he termed “the leprosy of Statism” (la lèpre de l’Étatisme), whereby the control of the state enabled a small group of people (perhaps 10% of the population) to gain economic and political benefits for themselves at the expense of ordinary taxpayers and citizens. The rise of democracy and political parties in the late 19th century meant that there was a new, more numerous group who wished to use the state to gain benefits for themselves at the expence of others. Thus the state expanded rapidly in size at all levels (local, departmental, and provincial) in order to provide jobs for the new political constituencies, thus creating a powerful mechanism for patronage and vote-buying at election time. The end result, in Molinari’s view, was the emergence of a class of “budget eaters” (“cette classe budgétivore”) which lived off the productive activity of the mass of taxpayers and consumers, and a major unraveling of liberal reform and a defeat for the “party of cheap government” (le gouvernement à bon marché). His prognosis for the 20th century was not good. He thought the “liberal party” which stood for individual liberty and free markets was going to go into decline and politics would be dominated in the new century by a struggle between the rising “socialist party” and a reinvigorated “conservative party” over how taxpayers’ money should be spent. The result would be external wars in the colonies as well as within Europe between the great powers, internal class war within European societies as revolutionary socialists attempted to achieve their goals by means of violence, all of which would reduce productive activity, increase taxes a regulation, and cause a massive expansion of debt. He hoped that after several decades of war, revolution, and economic decline people would come to their senses and a new anti-socialist and anti-protectionist party - what he called “le parti du moindre gouvernement” - would emerge eventually out of the economic rubble. On peut donc prévoir que la lutte pour la possession de l’Etat et la confection des lois, qui s’est poursuivie dans le cours du xixe siècle entre le parti conservateur et le parti libéral se poursuivra au xxe entre le parti conservateur et le parti socialiste. On peut prévoir aussi que cette lutte ne sera pas moins ardente, et selon toute apparence moins stérile que ne l’a été sa devancière, et qu’elle engendrera la même série de révolutions, de coups d’état, avec le dérivatif sanglant des guerres étrangères et des expéditions coloniales, qui ont constitué ce qu’on pourrait appeler le passif de la civilisation du xixe siècle. Eventually the health of the indefatigable Molinari gave out in 1909. At the grand old age of 90 he had to resign as editor of the JDE in November 1909 because of ill health. He continued to write, publishing four more articles in the JDE during 1910 before his strength gave out. No more articles appeared in the JDE but his last book appropriately called Final Thoughts: My Last Book was published in 1911. What is striking about this book (especially his preface) is that after nearly 70 years he is still advocating the same set of principles of “la liberté des échanges et la paix” and cheap government (‘le gouvernement à bon marché”), even though he now admits “ces idées fondamentales sont partout en baisse”. He has become even more pessimistic on the eve of World War since people everywhere have lost their earlier horror of war as fighting had become increasingly displaced to countries outside Europe in their colonies and the third world and people had forgotten the horrors of the wars which had been fought on European soil. They had also lost their previous distrust of government and their wariness of high government expenditure and public debt. Thus, he sadly concluded that the cause of liberalism had lost the moral battle with statism in its various forms and society would have to pay the consequences for that loss. Molinari spent his last summer in the Belgian seaside resort town of La Panne attended by his step-daughter Mlle Marie Le Roy who was a member of the Political Economy Society and his secretary. According to Guyot’s account, Molinari was feeling well enough in the autumn to move to a villa in nearby Adinkerque where he died a few months later on 28 January, 1912. He was buried in Père-Lachaise cemetery in Paris. Historically, Molinari was important for the role he played for 70 years in the emergence and development of the “Paris School” of political economy between 1840 and 1910. He and a number of other key players (such as Guillaumin and his daughters who ran the firm after his death, Joseph Garnier, Horace and Léon Say, and Frédéric Passy) provided the continuity needed for the school to function, especially as editor of the flagship Journal des Économistes for 28 years. Although he was less of an original economic theorist (in terms of high theory) he was nevertheless a very original thinker when it came to applying economic ideas to the real world. For example, his willingness to apply economic analysis to everything, such as the Church, the family, the government itself and its bureaucracies, and the private provision of public goods, was unmatched at the time. In many of his insights into the behaviour of government leaders and bureaucrats showed an understanding of human behaviour which in our time has been taken up by the Public Choice school of economic s pioneered by James Buchanan and Gordon Tulloch in the 1960s. A final point to note, is that Molinari was very much in the classical liberal tradition of class analysis which, until it was eclipsed by the inferior Marxist tradition, showed much originality and vibrancy throughout the 19th century. Molinari’s way of looking at exploitation by ruling and privileged classes of the ordinary taxpayer and consumer was the backbone of both his journalism and his history and sociology of the state. In this, Molinari was working very much in the tradition of his admired predecessors J.B. Say. Charles Comte, Charles Dunoyer, and Frédéric Bastiat, a tradition which is also undergoing a resurgence of interest today. By “now” I mean since the 1950s, when Molinari’s work (along with that of Comte, Dunoyer, and Bastiat) was rediscovered by a new generation of scholars who would help mold the modern American libertarian movement, in particular the branch of the movement which goes by the name of “anarcho-capitalism”. This of course is not the only stream of thought within the modern libertarian movement, but it is a strong and influential one and Molinari had a profound impact on its emergence and the course it has taken. that political economists should continue to speak to the ordinary person in order to spread the understanding of free market ideas by means of popular works. But perhaps the important insight he had was that the greatest threats to individual liberty and human prosperity were, and still remain today, the scourges of protectionism, militarism, socialism, and “étatisme” in general.